CHANDLER, Ariz. (CNS) — David Campbell believes he has died twice in his lifetime. He was not breathing at birth. Then, as a young soldier, he was hit by an exploding grenade and resuscitation efforts nearly failed. As Veterans Day approached, Campbell reflected on his service, the pain he endured after war and how, after two decades of emotional and mental anguish, he found some relief in a healing retreat and a new form of psychotherapy. Pfc. Campbell served as a combat engineer in operations Desert Shield and Desert Storm. The son and grandson of military men, he was born on an Army base in Fort Hood, Texas, and enlisted at age 17. His basic training began Aug. 2, 1990, the day Iraq invaded neighboring Kuwait. When he arrived in the Middle East, he spent time in a forward operating base. Then the ground assault on Iraq began and he was among the infantry forces sent to destroy Iraq’s military capabilities. Campbell’s duty was to help clear away anything blocking the movement of his tank unit. Later, he fell victim to the explosion that nearly killed him. “I was inside an enemy bunker and I have no memory of what happened,” he said, adding that he has doubts about what he was told — that the blast occurred when his team was about to set off a charge to destroy enemy paperwork. 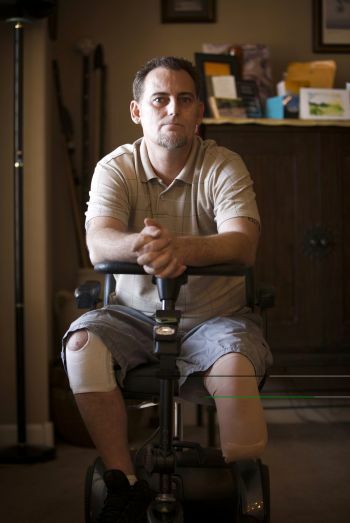 He spent six weeks being treated in mobile Army medical units. When he returned to the U.S., he received disturbing news. He said he had a lot of anger and that his nightmares would not subside. He worked as a photographer at a portrait studio and was great at it, he said. But he kept turning to alcohol and drugs to try to avoid the nightmares and thinking about the war. Then, after some providential connections between friends and his therapist, Campbell said he realized things had to change. Campbell began EMDR (Eye Movement Desensitization and Reprocessing) psychotherapy, a process that helps people with traumatic memories develop a way to recall the events without experiencing the powerful emotions tied to those events. 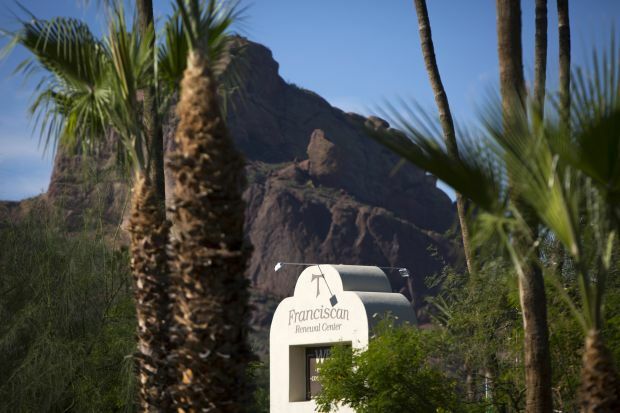 He also attended a weekend workshop for veterans at a Franciscan retreat center in Scottsdale. “Luckily we’ve found the Franciscan Renewal Center and they’ve given us the opportunity to heal through ‘Healing of Memories,’ and to me that’s been huge,” he said. The workshop is led by the Rev. 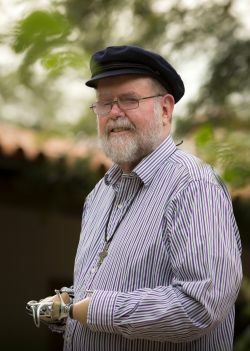 Michael Lapsley, an Anglican priest and missionary to South Africa, where he was an anti-apartheid activist. Rev. Lapsley was maimed by a letter bomb in 1990 as he worked with the African National Congress. He lost his hands and right eye in the explosion and his eardrums were shattered. There were other injuries too. He returned to South Africa following the dismantling of apartheid and witnessed an entire nation “damaged” by the experience. He began reaching out to people who had suffered violence of any kind. Part of the process was to “create safe and sacred spaces where people could begin to deal with what they had inside of them,” he said. Rev. Lapsley brought his “Healing of Memories” retreat to the United States in 2008, offering it first to veterans in Minnesota. In 2013 the Franciscan Renewal Center hosted the retreat. Dozens of veterans, including Campbell, attended at no cost. The center hosted two more workshops this year and is planning for three in 2015. The focus of the workshop is storytelling and small-group discussions. While at the Franciscan center, David Campbell said he learned a bit about St. Francis of Assisi and his own time as a soldier and prisoner of war. Campbell has presented talks to police and firefighters and to other veterans about his healing journey. He was honored earlier this year by local veteran groups and the local ABC affiliate for that work and his work with at-risk youths. He’s also being trained as a facilitator for future “Healing of Memories” workshops. His main message is “help is out there and healing is possible,” but he said he never plans the talks he gives. He was scheduled to address a Veterans Day picnic at the Franciscan Renewal Center Nov. 9.